The notes are made from heavy copper wire and a colorful, glass gem. Each is about 3 1/4" tall with a small wire for hanging in your window or on the Christmas tree. Many colors are available. The treble clefs are made from copper wire, a glass "egg" and a small glass gem at the bottom. Each is about 6 1/2" tall with a small wire for hangin in your window or on the Christmas tree. Many colors are available. They make great gifts for the home, office, school or the music teacher. Notes are $2.50 each + shipping/handling ranges from $3 to $5. 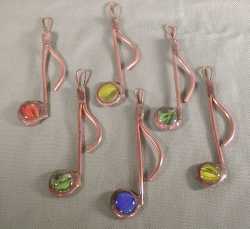 Treble Clefs are $6.50 each + shipping/handling ranges from $3 to $5. Several can be shipped together or with another item for lower shipping costs.